Dear Sweet Trailhoss - how are ya?!?!? It's been way too long my friend. Trailhoss! Do you have any new weinie pics? I always loved your weinie pics! Hello.. I apologize, I don't remember you. Did you go by a different user name back then? I haven't been to HC in close to a year myself. I think I may have logged in once last year. Glad to hear things are going well for you. ...and I apologize to you that everyone seems to have ignored you. Horse people are usually known to be friendly people....at least where I come from. Hard to believe that many people opened your post and not one even said 'welcome back'. I I'm glad you came back! I'd be interested in seeing some trail riding pics taken down in Georgia, I've never ridden there. I hope to find time to log in here to HC every now and then. Hello Grouchy.. I hadn't been to HC in quite awhile. I was so sad for you when I read this post. I'm so sorry for the loss of Cloudee and your Golden. I've been through it myself a few times so I know how it feels. It's amazing how attached we can get to our animals. I'm sorry to hear about you and all your surgeries too. I'll say a prayer for you that you'll be healed up and back to par quickly. I am going to try and find time to log in here every now and then so I can keep up with what's going on with old friends. I just hadn't been here much.. was busy this summer. I had 2 daughters to tie the kno this summer! I haven't been in the saddle much lately either.. I plan for that to change too! I'll be back to check up on ya old friend! I miss the stories and the pictures too! Enjoyed the stories and pics from your office. You have some mighty fine views from that office window!!! My husband spent some time in Montanna and N.D. the past few months. He's been working around in Wyoming a little now. Next time he's out your way, I may hook up the trailer, load some horses and come visit ya! I know I've been sayin that for awhile, but maybe I can make it out there someday for real! She trains gaited horses for trailriding. She has some for sale occasionally. 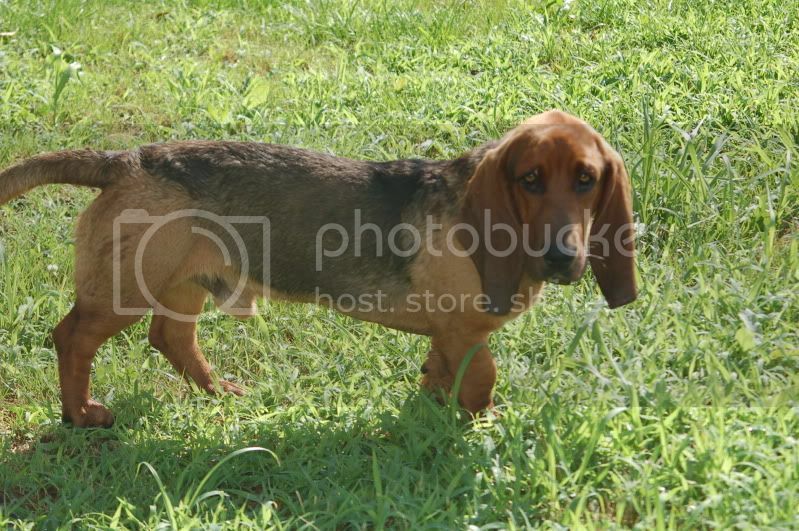 Bassets are hounds and they follow their nose. Neutering may help but it will not stop him from taking a "walkabout"
I know you don't want to spend the money, but neutering would more than likely solve the problem. I would definately spend the money to fix him if i thought it would fix the problem. However, my vet says he thinks he was too young for "that" to be the reason he's out and about. He's just exploring... and well he found the neighbor's houses. The problem I'm having now, is he is teaching my collie to leave and I can't have that. The collie is getting neutered on the 6th of July. There's a member here on HC that I'm also friends with on FB and she belongs to a Basset rescue group in Central/northern Illinois. She said she was going to ask around. I've had to tie him up and pen him up because he's causing my collie to want to roam with him. As long as he's confined the collie won;t leave. However if I confine the collie , the basset still roams... which proves who the culprit is! This is Lil' Bit. He needs a new loving home. He is a very sweet boy who LOVES people and attention. He gets along great with other dogs and with cats. He's been around horses and does well around them also. Lil' Bit came here about 3 1/2 months ago when my daughter brought him home to keep him from going to the pound. He is full blood Basset. he is the son of my daughter's ex's Basset Hound who he bred to his neighbor's female and got this pup back. (then decided he didn't want him). He is pure bred but I don't have any registration papers. He's not show quality or anything and will need to be nuetered. I just have not done that yet since I am not planning on keeping him I don't want to spend the money to have it done. He has all his vaccinations except for his Rabies vac which he was scheduled to get 2 weeks ago when the vet was here doing coggins on the horses but lil' Bit was over visiting the neighbors so he did not get his vaccine. Which brings me to the reason I am looking for a new home for him... He likes to leave the property and go visit with the neighbor dogs. He doesn't go all the time, not even every day but he will go. he always comes home but I can not have him out roaming the country. If you think you would be interested in giving Lil Bit a home, please contact me. I will have questions for you as I am not just going to giuve this dog to someone without knowing what kind of a home he's going to. No I've thought about all this before. The kids thing. Hahaha not gunna happen but say it did I don't know what I'd do. But yes the whole family thing who see's who at what holiday. Right now we don't see my family on holidays we did one x-mas eve for a few hours. It's just so far his car is some what new he doesn't like to put those kind of miles on it. 3 hours home from where we live. I was hoping to save enough for a car so I can go back and fourth now and again. I hardly get time off work that doesn't help. He just says find some where else to get married. Like what half way? Rochester? I don't even know where or anything around that area. That just doesn't make sense but I figured what he meant but I could be wrong. Wow... I agree with Becaco. You obviously aren't high on his list of priorities. I can only see lots of frustration and pain in your future. I would and have drove four hours on many occassions to support my wife and her family. Let alone for something as meaningful to you and your grandmother as your wedding. So much in there just screams red flags. If he won't even give a little for your wedding day then I'd hate to think how the marriage will be. Marriage is a relationship that two people work together.... not One person getting everything their way. A gal's wedding day is supposed to be all about her. He doesn't even seem to care if you have any happiness on this event. Personally, if it were me, I would be done with the whole relationship. If he doesn't love you enough to compromise on your wedding day then he doesn't love you enough. (period). It sounds to me like you haven't met Mr. Right yet. When you do, not only will you be head over heels in love with him but he will be with you too. Love cares about the other person... it isn't stingy or selfish.